CDR is consumer-controlled and community-based. Operated and administered by persons with disabilities who live in the communities we serve, the same individuals who receive and benefit from the programs decide which programs CDR will provide and how they will be administered. CDR is a single point of access to resources for all people regardless of the nature or type of disability. CDR’s mission is to promote options that empower people with disabilities to achieve their full potential and live independently, fully participate in their community, and exercise their rights as citizens. It shall challenge, through advocacy, education and citizen action, those systems that limit such options. For more about CDR and our history, visit our CDR History page. CDR is one of five Centers for Independent Living (CIL) in Connecticut. Below is a list of all the CILs in Connecticut. For more information visit CACIL.net. Our catchment area includes the following towns: West Haven, Milford, Orange, Woodbridge, Clinton and Old Saybrook. Due to legislative budget cuts, we can only serve the towns listed above. Before said budget cuts, our catchment area used to include the following towns: Shelton, Derby, Ansonia, Seymour, Orange, West Haven, New Haven, Woodbridge, Bethany, East Haven, North Haven, Branford, North Branford, Wallingford, Meriden, Southington, Guilford, Durham, Middlefield, Middletown, Cromwell, Portland, East Hampton, Haddam, East Haddam, Madison, Clinton, Killingworth, Westbrook, Old Saybrook, Essex, Deep River, Chester. If your town isn’t in this list, then you would probably be served by one of the other CILs listed here. Disabilities Network Of Eastern Connecticut Inc. 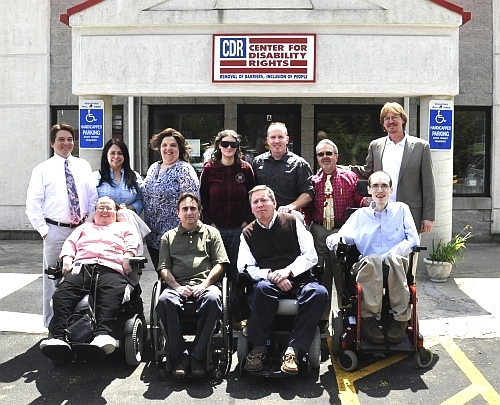 The Disabilities Network of Eastern Connecticut serves the population in Windham and New London counties. The Eastern Community Choices serves towns in New London, Middlesex, Tolland, and Windham counties including Lyme, Old Lyme and East Lyme. The Southwestern Community Choices serves the following towns: Bridgeport, Darien, Easton, Fairfield, Greenwich, Monroe, New Canaan, Norwalk, Stamford, Stratford, Trumbull, Weston, Westport, Wilton. The following towns are served by Independence Northwest: Barkhamsted, Goshen, Newtown, Southbury, Beacon Falls, Hartland, Norfolk, Thomaston, Bethel, Harwinton, North Canaan, Torrington, Bethlehem, Kent, Oxford, Warren, Bridgewater, Litchfield, Prospect, Washington, Brookfield, Middlebury, Redding, Waterbury, Canaan, Morris, Ridgefield, Watertown, Cheshire, Naugatuck, Roxbury, Winchester, Colebrook, New Fairfield, Salisbury, Wolcott, Cornwall, New Hartford, Sharon, Woodbury, Danbury, New Milford, Sherman. Independence Unlimited, Incorporated (IU) is a non-residential, non-profit center for independent living that serves very diverse populations in 38 cities and towns in mainly Hartford County. The North Central Community Choices serves the following towns: Andover, Avon, Berlin, Bloomfield, Bolton, Bristol, Burlington, Canton, East Granby, East Hartford, East Windsor, Ellington, Enfield, Farmington, Glastonbury, Granby, Hartford, Hebron, Manchester, Marlborough, New Britain, Newington, Plainville, Rocky Hill, Simsbury, Somers, South Windsor, Southington, Stafford, Suffield, Tolland, Vernon, West Hartford, Wethersfield, Windsor, Windsor Locks.